I was at the MIG Club at Bandra East a couple of days back. The occasion was a joyous one. A surprise party thrown for a dear friend. We were keen to make the surprise work and reached the club well before him. It started to rain heavily after we reached and I was worried that my friend would decide to stay back at home and order in. However there was no stopping the ladies in his life, his wife and daughters who had planned the party, and they brought him over and he was suitably surprised to see us. We settled down after much laughter and excitement at the Belvedre which is the one of the restaurants in the club. For some reason, almost all clubs and old hotels seem to have a 'Belvedre' tucked in somewhere. If anyone knows why, then please do let me know. We started off the evening with fish fry, prawns and capsicum stuffed with chilli which apparently are favourites of our hosts at the club, along with some beer and wine. The time to order our mains came and I spotted a special menu which said 'Gatari' menu. 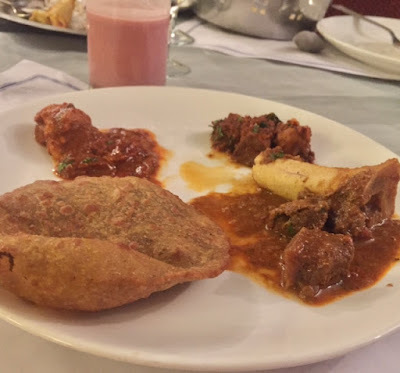 On the menu was an array of Maharashtrian non-vegetarian dishes. The caterers who run restaurant, Nebula, are Maharashtrian so something told me that the Maharashtrian menu would be good. I suggested that we order from that instead of the Chinese or the lasagne (a classic Mumbai favourite for some reason) I saw some young men at the next table have. When I later put a picture of what I ate that night on my Instragam stories and put the hashtag 'Gatari' with it, I got questions from a few Mumbai based non-Maharashtrians about what Gatari is. I had heard the term Gatari before too and vaguely knew that it was something to do with the fasting that was coming. The group at our table consisted of Punjabis, Sindhis, Bengalis and Malayalis but no Maharashtrians. So no-one seemed to know much about Gatari which is observed primarily by Maharashtrians. I asked the waitstaff and then later looked up on the internet to know more and also got some feedback from folks on Twitter and Facebook about what Gatari is all about. From what I gathered, Gatari is the four day period before the start of the month of Shravan in the Hindu calendar. It falls during a full moon period and is traditionally called Deep Amavasya and by some, Gatari Amavasya. Shravan is a period when people from many communities go on a restricted and vegetarian diet and abstain from meat and alcohol. Most Maharashtrian meat eating folks (some Maharashtrians are vegetarian too) observe a vegetarian diet during this period as do they do during the Ganpati festival. One of the few exceptions, as Bimba Nayak had once told me, are the Pathare Prabhus. The Pathare Prabhus are one of the original settlers of modern Mumbai. Bimba, a Pathare Prabhu herself, told me that her community's love for meat and alcohol means that they don't abstain from either during Shravan. As far as the rest are concerned, the four days of Gatari have today come to symbolise for many a period for drinking with gay abandon fuelled by spicy meaty treats before Shravan starts. Interestingly, the word Gatari has now been corrupted and in colloquial slang stands for the word 'gutter' as Aurobindo Mohanty on Twitter told me. Light hearted banter dictates that you are supposed to drink till you fall into the gutters. I guess I, with my glass of beer which I didn't finish, was a bit of a let down to this Mumbai tradition. Given the way it has been raining in Mumbai, you would be advised to walk carefully if you have put back a couple of drinks in any case. Janhavi Pandit It's basically known as Deep Amwasya .. Ending of the Ashaad Month and commencing of the Holy Month of Shravan... Gatari is a slang and has no religious or cultural relevance in Maharashtrian culture !! Actually it is gat-aahari amavasya. 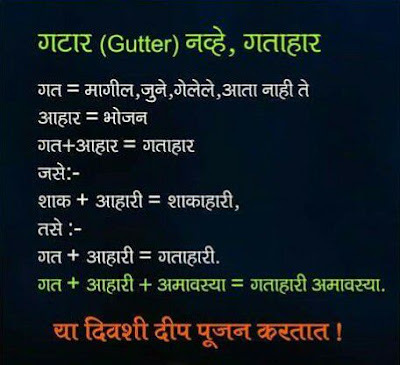 Gat means last or previous, same as in Marathi like gat varshi meaning last year. Here it means earlier or previous food. It means having the previous type of food that was eaten during the year on the amavasya before abstaining from non veg & alcohol. It is beginning of the period when most non veg eating communities do not eat non veg food & some devout ones not eating onions and garlic as well along with alcohol for the period beginning from Shravan month until Ganpati immersion from the people's homes. After that period people start eating non vegetarian & having alcohol again. Of Gatari & falling in the gutter after drinking, I am not aware of the origin. It was just a play of words which started as a joke and has become a main stream word with the actual meaning almost forgotten. Gatari is not just a Mumbai tradition/ phenomenon though. My friend Sanchita Banerjee Rodrigues, a Bengali married to a Goan Catholic and who lives in Goa too, tells me that Gatari Amavasya (new moon) is observed across neighbouring Goa too. She compares Shravan that follows, with Lent when many Christians abstain from meat and alcohol. I feel happy at such times that I am a Bengali and that we do not follow such customs in our family. Which also meant that I needed to stick to portion control that night because I didn't have 40 meatless days to balance the feast. I called for a sol kadi, the popular and pungent coastal drink made with kokum berries, coconut milk and crushed chillies and spices. The one at Belvedre was fairly good and made me feel that the main courses would be so too and they indeed didn't disappoint. Here's what I had from the Gatari menu. There was a Kolhapuri chicken and in Mumbai, anything 'Kolhapuri' usually means that the masala will wallop you with its inherent chilli heat. Then there was the kheema gurda kaleja kapoora. Minced goat meat sauteed and cooked with goat's liver, kidneys and testicles. If you thought that only Parsis and Muslims eat offal in Mumbai, then you are wrong. 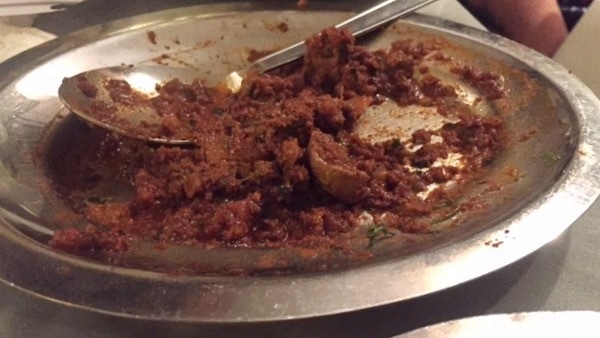 Many Maharashtrians eat it too and most Malvani restaurants would have the odd offal based dish on the menu. One example is the vajre. The kheema here was a lot more power packed in terms of spice and chilli heat levels compared to what you get at the Irani cafes of Mumbai. The third dish that I tried is the Aagri mutton (goat meat) curry. Dr Pradeep Rao, who loves his food apart from being an internationally renowned urologist had grown up in Dombivili where many belonging to Agri community live. He had often praised their food to me so I thought I should try out the Aagri curry. Unlike in the Kolhapuri chicken, which had a thick masala base, the Agri mutton curry was thin and silken and yet flavourful. The goat meat pieces were cooked to tender submission. The waiter gave me a marrow bone. The comfort of being with friends meant that I didn't feel awkward about sucking the pliant bone marrow. With Pradeep not around, I can't tell you how authentic this was but it sure did taste good. To accompany the meaty dishes, I had vade which are the multi-grain puris that are favoured by the Malvani community. Interestingly, each of the the three dishes had a mild coconut aftertaste to them. I asked the waitstaff about it and after a game of Chinese whispers, going right up to the chef, they reported to me that all three dishes used coconut in various forms. The dinner was a rare case of one where the main courses were better than the starters. The chef was clearly on home ground with the Maharashtrian fare and was quite inspired. Gatari eating is not the time for the lily livered. Like I said, I barely had a beer. Moreover, as someone who can't handle spicy food, I kept mopping the sweat off my head while I ate and took small portions. However, you have the whole of tomorrow and Sunday lunch to drink up and knock in some spicy meaty fare to do justice to Gatari. Update: Given posts put up by Maharashtrians on Facebook and some comments in response to my post, I thought I should add that Gatari is not a religious mandate, more a modern social phenomenon. Obviously, not universally followed as I had mentioned earlier.